Many detractors of the Scrum framework claim it to be too thin and does not include the prescribed Agile engineering practices like XP. Scrum is actually supposed to be a very light weight framework for a company to adopt into the development process. It is minimalistic on purpose. As far as the engineering practices, one does not have to search too hard to find all the primary originators of Scrum stating that it is a management wrapper for XP. The Control Chaos website has a good summary of the xp@scrum approach here. During my Scrum Master training, Jeff Sutherland himself featured the graphic below prominently in his first few slides and stressed how the engineering practices of XP were essential to getting more productivity out of any Scrum implementation. 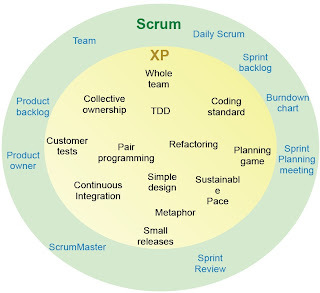 Ken Schwaber has also co-authored an article about combining Scrum and XP. In general, Scrum leans more towards a management process that supports Agile development processes like the ones prescribed in XP. I personally believe that you cannot be very successful with Scrum without implementing things such as Continuous Integration, Unit Testing (TDD), Coding Standards, Small Iterations, Sustainable Pace, etc. I also think Scrum is a bit more acceptable to the masses (which some people also site as a detractor) that a pure implementation of just XP. It is called extreme programming for a reason! Hopefully this combined approach will be what people implement rather than just adopting the Scrum mechanics and continuing to develop with their same, non-agile methods. This would most likely lead to failure and that usually gives people the impression that the reason for the failure was Scrum. The problem with Scrum today is not Scrum, but the fact that many apply it without understanding that it is just a framework for supporting the development process and practices. Many apply the framework, but not the content (like XP). In that sense it is a shame that it was Scrum that became the hype and not Xp.